That number should sound familiar to NFL fans. 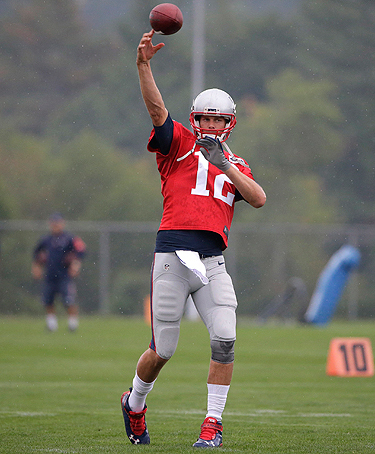 Tom Brady’s projection on how long he’ll last routinely lands on that number. And Drew Brees flat out said two summers ago that’s the age he plans to play to. It’s no coincidence. All three quarterbacks, and dozens of other NFL signal-callers, got that number from House. And the results all those guys have gotten out here—a pretty bare-bones setup at a SoCal junior college—make it so they take what House says as gospel. In this week’s notes, I’m going to hit you with nuggets from the first half of a 10-day camp swing. Topics will include: where job security affects team-building, how Ben Roethlisberger’s gotten himself in shape, why the Browns think people are overstating their commitment to analytics, and a look back at why Steve Keim took the plunge on Tyrann Mathieu three years ago. During his four-game suspension, Tom Brady will spend time working with Adam Dedeaux. But we’ll start by following up on the long-form video project—we have a lot more of these coming, too—that debuted on the site Tuesday, which details why 13 current starting quarterbacks, dozens of NFL backups, and some prominent college kids (Ohio State’s J.T. Barrett is one) have flocked here. Watch it above, and you’ll see what they’re doing, how they’re doing it, and why they all come. Here, we’ll look at the tangible results, which House can take you through one-by-one. Browns rookie Cody Kessler, through mechanical tweaks, is now throwing the ball 10 yards further than he could on draft day. Matt Ryan’s functional strength is night-and-day from what it was when he first came here. Andy Dalton’s become a more vocal leader. Robert Griffin has learned about how he carries himself. That all ties into what’s been said by guys who’ve worked with House (Super Bowl champions Tom Brady, Drew Brees, Eli Manning and Joe Flacco among them). It’s about developing a total athlete. As we laid out on video, House and fellow former USC pitcher Adam Dedeaux (who recently bought out House’s 3DQB company) test in four areas: Biomechanics, mental/emotional, functional strength, and nutrition/sleep. With Griffin, there certainly was mechanical work to fix. House and Dedeaux taught him—and Florida State coach Jimbo Fisher echoed these words in a talk with Griffin later in the offseason—to view throwing like firing a gun, in emphasizing you won’t shoot straight from different slots. And the coaches also worked with Griffin in how his demeanor comes off around others, and made him more conscience of it. Similarly, where Dalton was always a lead-by-example quarterback, House and Dedeaux were able to pull from him an ability to be more demonstrative, without acting like someone else. House says, “Everyone we touch gets better,” but he, Dedeaux, as well as fellow coaches John Beck and Taylor Kelly can single out one young quarterback who’s improved more than anyone. His name is Blake Bortles. 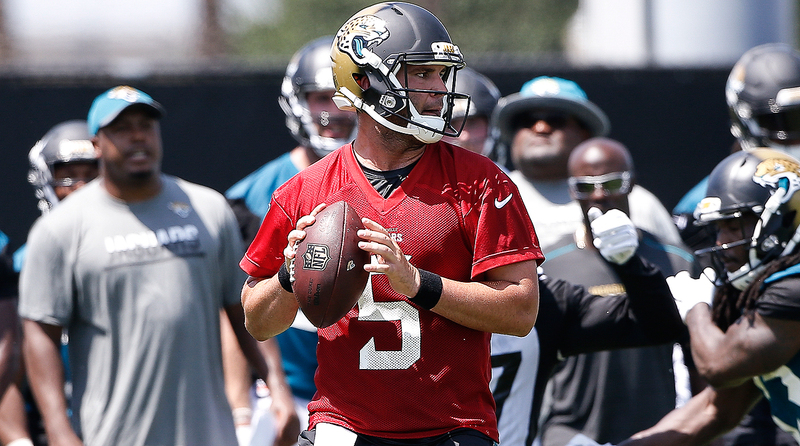 As the Jaguars quarterback’s rookie year wound down in 2014, his arm was dying. His already-rebuilt mechanics broke down and reverted as a result. Bortles heard of House through word of mouth, which is how this business was built, and decided to give it a shot. He quickly found out how little he knew. “I didn’t have any clue. I didn’t know,” Bortles says. “Nobody had ever told me I had bad mechanics. Nobody told me any of that stuff. It’s funny, the first day I brought my brother (Ole Miss third baseman Colby Bortles) out here, within five minutes, Tom told him, ‘You have awful throwing mechanics.’ I heard that same thing and it was the first time I’d ever heard it, which is crazy as a 22-year-old who just finished his rookie year in the NFL. So guys come here before OTAs to rework things, and after them to tune up for training camp. They take the drills with them, and House and Dedeaux work with their NFL coaches to make sure everything is aligned—even helping manage the coach/player relationship. During the season, the starters that House and Dedeaux work with will routinely fly them to their NFL cities for tune-ups because, as House describes it, you lose 1 percent of your mechanical efficiency in every game and you never want that number to hit 10. When Brady starts his suspension in September, it’ll be Dedeaux he works with to keep him sharp. Everything is quantified and backed up with science by House (who has a PhD in performance psychology, an MBA, and a masters in counseling psychology) and his staff. They give all the players the “why” to what they want them to do. And each program tailors to each athlete. There is, of course, a reason why Brady hails them to Will Rogers State Park one day, and Brees to a San Diego high school the next. 2. The trouble with coaching turnover. Want a tangible way in which all the coaching turnover throughout the NFL is starting to affect competitive balance? I asked Buffalo’s Doug Whaley how he’s different as a GM now than he was when he moved into that seat in 2013, and I thought his answer was illuminating. “Biggest thing I’ve learned is, from the personnel side, no matter what just get best players out there, because the best players can transcend any system,” Whaley said. “And especially with us, for whatever reasons, we’ve changed systems a lot. We’ve just come up with a philosophy, especially for what I’m hired to do, it’s to get good players. Let’s just get the best players out there. Don’t try to fit them into a perfect system.” This will be Whaley’s fourth season, and it’ll be the first time he has the same system in place in back-to-back seasons on both sides of the ball. After 2013, the Bills lost defensive coordinator Mike Pettine to the Browns and hired Jim Schwartz. After 2014, Doug Marrone bolted and his replacement, Rex Ryan, turned over the entire staff. For a case study, take safety Duke Williams, the Bills’ fourth-round pick in 2013. He was drafted to play in Pettine’s system, had to adjust to Schwartz’s in ’14, then to Ryan’s (which isn’t far off from Pettine’s) in 2015. Three years, three coordinators. Guys drafted by the Patriots or Packers or Panthers don’t have to endure that. And that continuity certainly helps those in the front office have a handle on what they’re looking for. As Whaley illustrated, it’s an advantage a precious few enjoy. • It’d be hard to improve on 15-1, but one big reason why the Panthers could be better this year than they were last is the big presence they’ll welcome back on the outside. 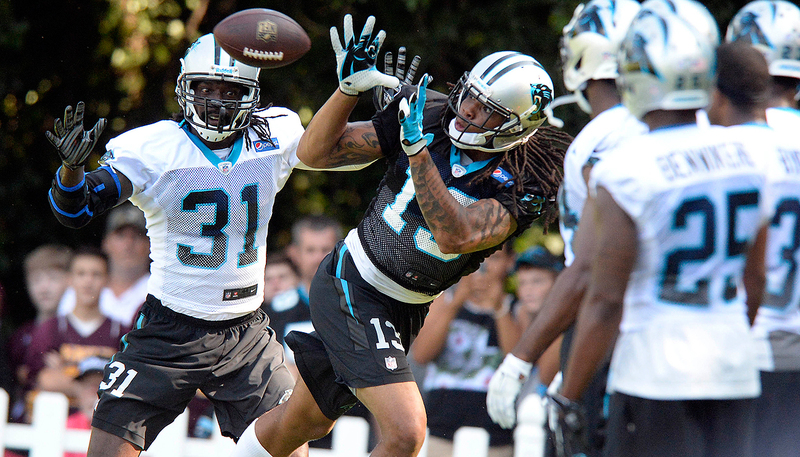 Kelvin Benjamin is back after ACL surgery, and one Carolina staffer put his early work in camp like this: “Looks like he never skipped a beat. Mentally and physically, he’s full go.” Benjamin had 73 catches for 1,008 yards and nine touchdowns as a rookie, playing a position that’s generally tough to adjust to coming from the college game. So pairing him with another monster target like Greg Olsen should make the Cam Newton-led offense even more imposing. • If you want to know why so many of Tom Brady’s teammates have gotten emotional about Deflategate, check out what he did for Kevin Faulk this week. Brady showed up wearing a No. 33 jersey at the former running back’s Patriots Hall of Fame induction. Brady, of course, was returning the favor for Faulk wearing his No. 12 at the draft, a show of support to the quarterback while Brady’s case was still snaking through the circuit court. Point is, Brady’s always found a way, even as he became a celebrity married to a supermodel, to remain one of the guys. And his gesture Monday was more proof of it, during a time while he’s otherwise gone into radio silence. • The success of Mike Zimmer and Bruce Arians has made old coaches new again. Both coaches were passed over time and again before getting their shot at an advanced age and crushing it. Who’s next? I’ve said for awhile that the one to watch going into the year should be Bears defensive coordinator Vic Fangio. He fielded consistently outstanding defenses in San Francisco, and has led a massive rebuild on that side of the ball in Chicago. He’ll be the same age in January, 58, that Zimmer was when he got the Viking job in 2014. 1. Quarterback Nick Foles*. That Chip Kelly and Andy Reid have stayed away isn’t the best sign, nor is the fact that the Rams couldn’t move him when he was owed just $1.75 million, during a time in which backup quarterback are getting deals worth more than $5 million per. The Rams had issues with his ability to process, and also saw a passer who had trouble standing in against the rush. Under Kelly in Philly, the ball was out quick and there were open spaces downfield with concepts that stretched the field horizontally. Last year, in St. Louis, in a more traditional offense where he’d take 3-, 5- and 7-step drops and had to read the field, he saw ghosts and threw off his back foot. 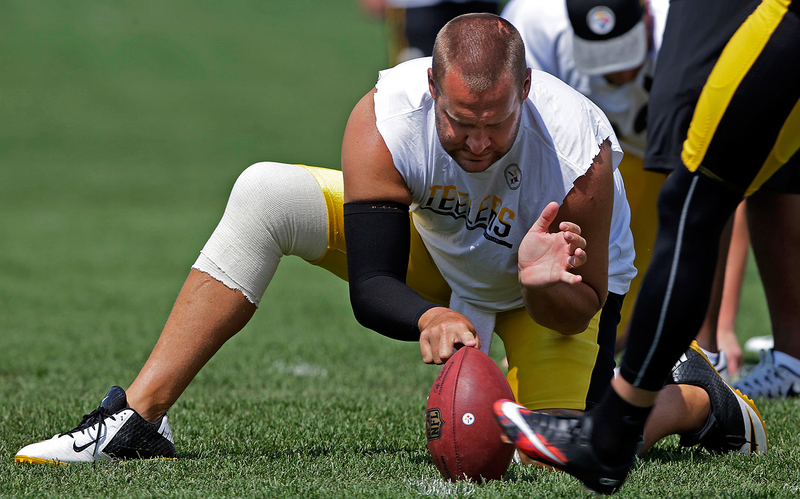 And one AFC exec added that it’s clear his slow release and feet compound those issues. All that said, it’s not like all hope is lost. One rival defensive coordinator assessed him like this: “Big strong-armed guy and he’s played in two completely different schemes. There’s an obvious skill set there, and he started for a playoff team and another team traded for him. I still think he can be a legit starter.” The first step, of course, is getting on a roster. *Editor’s Note: News came that Foles reportedly will sign with Kansas City—reuniting him with Reid—late Wednesday night. 2. Wide receiver Roddy White. Until Andre Johnson signed, I figured White might not be able to find work. Now that Johnson—coming off a pretty sideways season—is on board in Tennessee, the idea of White getting work seems a little more plausible. He’s just a year removed from an 80-catch season, and an injury somewhere else could open opportunity. “He could just squeeze another year out on pride,” said one NFC pro scouting director. “The issue with Roddy is there’s maintenance needed with his knee, a team would have to be OK with dealing with that, and his personality isn’t for everyone. He’s not a bad dude, just a little headstrong. He’ll need to play for someone he respects. He respected (Terry) Robiskie, so he wouldn’t fly off at the mouth. He has to respect you. And he’s been quoted saying he wants to play for a contender, so that narrows the field. But he’d bring a veteran presence, he’s seen every DB, he knows how to get open, and can move the chains. There’s a role for him somewhere.” Now, the flip side of relating White to the Titans is they chose Johnson over him, even though Robiskie now is the Titans offensive coordinator, and White previously played for head coach Mike Mularkey and alongside receiver Harry Douglas. So that doesn’t look great. But again, if Johnson can get a chance somewhere after a down 2015, it makes sense that someone will kick the tires on the Falcons’ all-time leading receiver. After Tyrann Mathieu signed his five-year, $62.5 million extension this week, I took a look back at a story I did with Mathieu right after he was drafted in 2013. And I remembered how Mathieu and I have a mutual friend, ex-NFL safety Artrell Hawkins, who insisted to me before the draft that Mathieu would get it right if he landed in the right spot, with the right people around him. Mathieu did, and our buddy was dead right. The takeaway is environment matters. When I was reporting out that piece, one thing that kept coming up was how lucky Mathieu was to land with Bruce Arians, who was known as a coach who could reach players from any background and get them to listen. Last week, I mentioned how many on the Cowboys staff realize now that putting Randy Gregory in a position group room with Greg Hardy was asking for trouble. This was the opposite of that. Mathieu not only had Arians, but also Todd Bowles, whom he had an existing relationship with, and former LSU teammate Patrick Peterson. And just as significant, Mathieu was a long plane ride away from where he grew up in New Orleans. Maybe he’d have made it anyway, but there’s no question that Arizona had the infrastructure to game the odds in its favor. 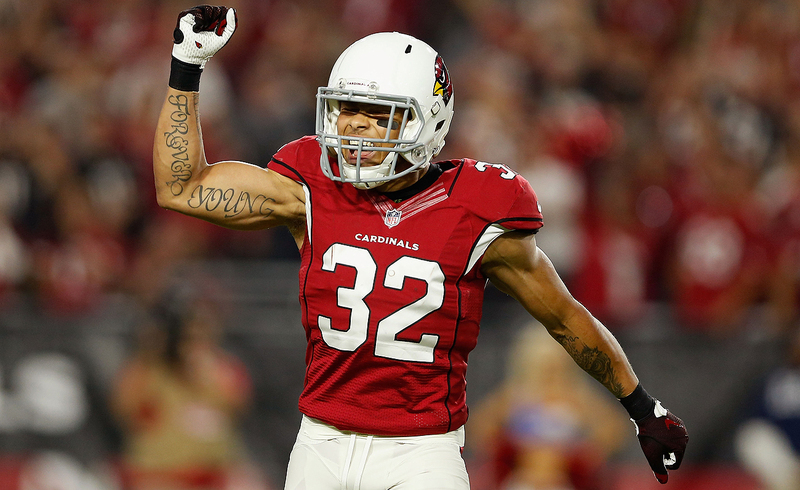 The Cardinals don’t have to say how much they like Mathieu anymore. The Brinks truck in his driveway says it all. And the organization deserves plenty of credit for helping get him there.